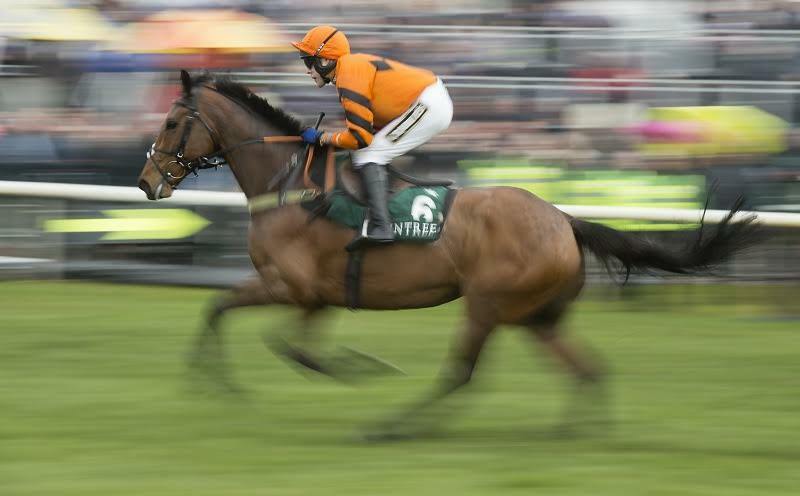 There are other races and other horses to consider at Aintree today, notably the brilliant Thistlecrack (3.40) and the almost-as-brilliant Douvan (3.00), but we all know that today is basically all about one race. The race. The race that everyone, however flimsy their interest in racing, knows. The race that gets even haggard old cynics who think they’ve seen it all before as excited as they were when watching their first National. 1982, Grittar, Hard Outlook, Loving Words (vague recollections of earlier Nationals may apply). To get you all in the mood, here are (some of) the thoughts of the peerless Lee Mottershead in today’s Racing Post, to whip you into a frothy frenzy of anticipation. The sight of 40 horses charging towards that first green fence like a Liverpudlian light brigade delivers a thrill that is unique. The Grand National is embedded deep within our cultural DNA and this afternoon, in front of a worldwide audience of 600 million, the wonderful old race has the potential to write one of its most special stories. You love the National, else you wouldn’t be here. What do you fancy? Where’s your money going? Will it be Nicholls? Will it be Mullins? Will it be Sherwood, Bailey or O’Neill? Will it be chips or jacket spuds? Will it be salad or frozen peas? We’ll have to wait and see. 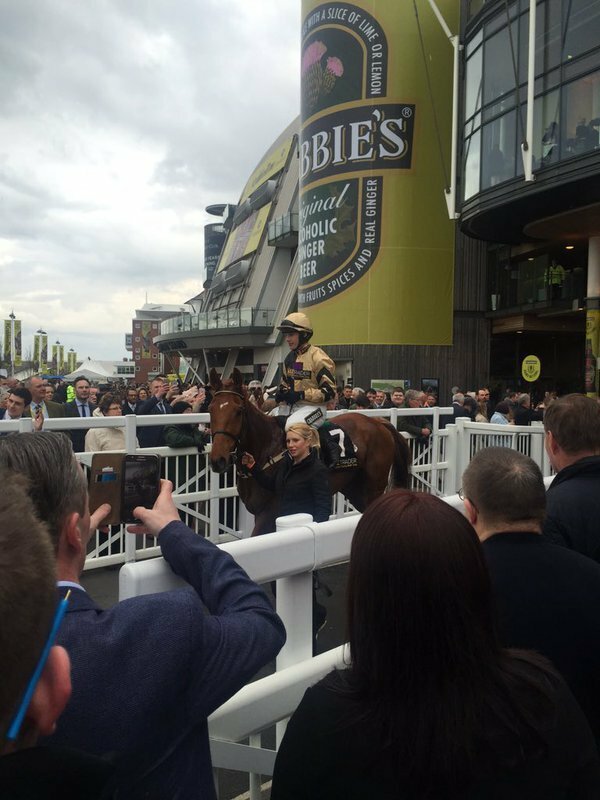 Until we do, get in touch and share your Aintree thoughts through the comment facility. You can’t tweet me because I’m not on Twitter, but don’t let that hold you back. Why don’t you email me at steve.dennis@racingpost.com, and if you don’t disappear into the darkest recesses of my spam folder I’ll broadcast your comments here. This blog needs you. Talk to me. Please. 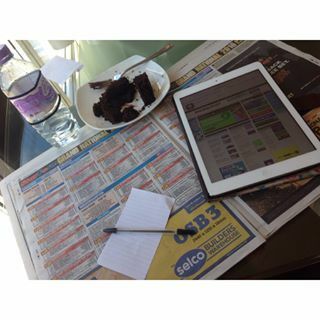 If you haven’t decided where your money is going today, here follow some brilliant Racing Post video options to help you make up your mind. I quite fancy The Last Samuri and Le Reve, but don’t let that put you off. There's only a little over five hours to go before the National gets under way, so why not settle back and watch last year's race again, to set the mood. Today isn't ALL about the Grand National though (drags mind away for a moment). The undercard bulges with fun stuff, and the undercurrent is whether Willie Mullins can wrest the trainers' championship away from Paul Nicholls. The Irishman has a lead, although not much of one. He might stretch it with Yorkhill and Douvan (although we all saw what happened to Vautour yesterday), but the outcome of the National will almost certainly decide the destiny of the title. It's also all about whether Crystal Palace can beat Norwich City, but I'll try not to let that preoccupy me overmuch. Yeah, right. Long House Hall is another non-runner in the opening race. Do you think Victoria Pendleton could ride around Aintree after her exploits at Cheltenham ? I'm eating a Creme Egg. It's the last one of Easter. I've looked at the card for horses that might be appropriately connected with the consumption of a gooey chocolate snack, but have had to admit defeat. Buywise, possibly, but it's a stretch. Nice egg, though. Nummy, nummy, nummy. Do you want to hear about anyone else? What about Pat Fahy and Morning Assembly? Hi ho Steve. What's your best bet this afternoon outside of the big one? Finished the Creme Egg, just in case anyone's interested. I disposed of the wrapper considerately. If anyone would like to send me another Creme Egg, I'll eat it while blogging and describe my emotions throughout. This would be a first in blogging but, hey, I'm a pioneery kind of guy. There's half an hour to the first race, a 19-runner three-mile handicap hurdle in which the phenomenally unlucky If In Doubt probably deserves compensation for his nightmare passage at Cheltenham. At Fishers Cross and Tiger Roll are previous Cheltenham Festival winners, and Paul Nicholls will be hoping to gather in some moolah through top-weight Silsol and/or Arpege D'Alene. Bechers Brook has had many revisions over the years and is a far safer proposition than that of old. What is leading to this current spate of fatalities at this fence. Is the fact that better horses are running in the race and it is now a very high class handicap or the fact that jumping errors are exacerbated by the large drops. I tend to think that one of the falls yesterday would have been fatal on any track ? Billie Mc is also game-ready. And she has cake. Ubak, eh. What did I Tulyar a bit further down? Hold the phone Steve! Is that a 16-1 winner you've just tipped? That race ushers in the first of the 'serious' contests of the day, in which Yorkhill goes out at a very skinny price to add to his Cheltenham Festival success. 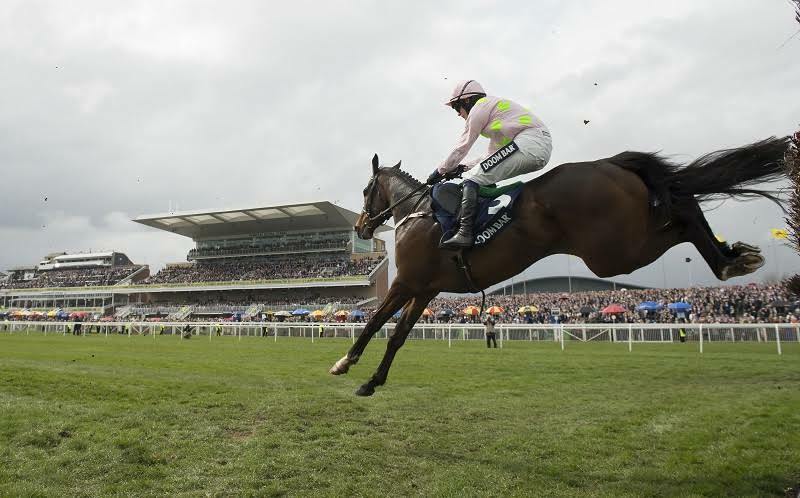 He looks unstoppable, but so did Vautour . . .
Will Shutthefrontdoor take over as National favourite from Many Clouds? There's only a point between them across the markets . . .
Douvan is an even shorter price for the novice chase than was Yorkhill. Is he a certainty? Dad's done miracles to get this horse back. He [Ubak] was a very impressive winner round here three years ago but has had issues since then, and it's been a very careful process to get him back to the racecourse. He went chasing earlier in the year; it didn't quite pan out how we had hoped, although he ran well a couple of times, so we thought we'd switch him back to hurdles for the end of the campaign and he's done us proud. That could not have been easier. Maybe Douvan really is better than Faugheen, Djakadam, Annie Power, Vautour and all the others. 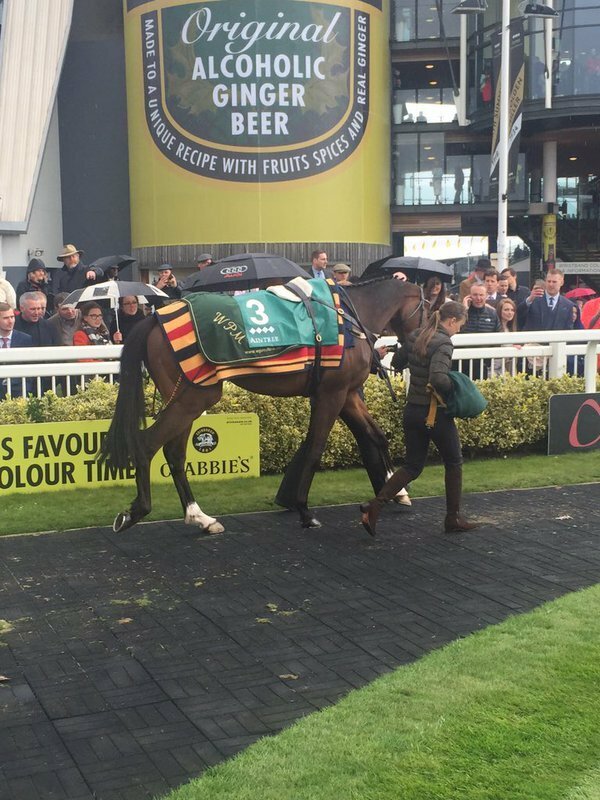 Paul Townend calls him a 'proper horse', says that for a big horse he's very clever, a big friendly giant. The rain is smashing down now. It's chilly, not very springlike. 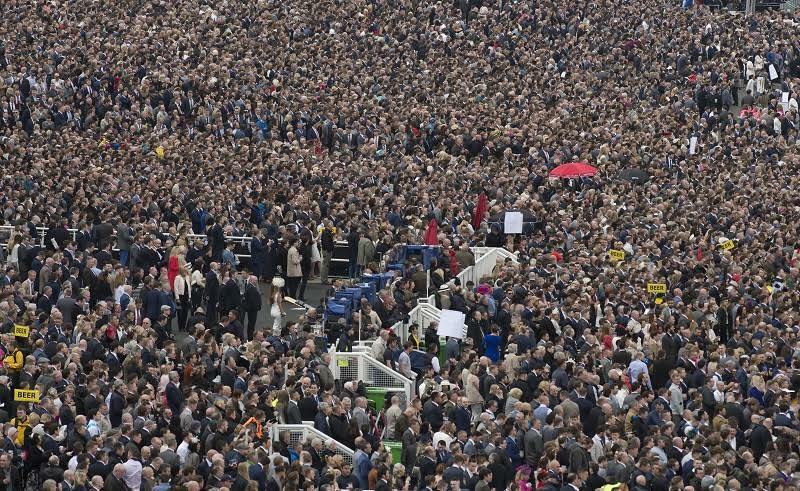 This will be a slow Grand National and quite attritional in regard to numbers of finishers. The next race is 'just' a three-mile handicap chase, but if I were a jockey I would prefer not to ride in it. I mean, the Grand National is about an hour away. I'd want to have a nice cup of tea, a sit down and a think. Jon, the rained-upon ground will, most of all, ensure that the overall pace of the race is a little slower than it would otherwise have been. The more testing conditions will find out those whose stamina is not assured, and allow those who might lack a little class but go on plodding forever to get into the race. Goonyella will like it. It will make carrying a big weight harder, so Many Clouds and Silviniaco Conti may be at a disadvantage. If anything you've backed has stamina doubts, you might want to hedge off. A shock. It's a mudbath out there, and Maggio coped very well with the conditions in the same colours carried by Auroras Encore. Poor Brian Hughes. He'd have ridden Maggio but for his fall earlier today. James Reveley was the lucky supersub.